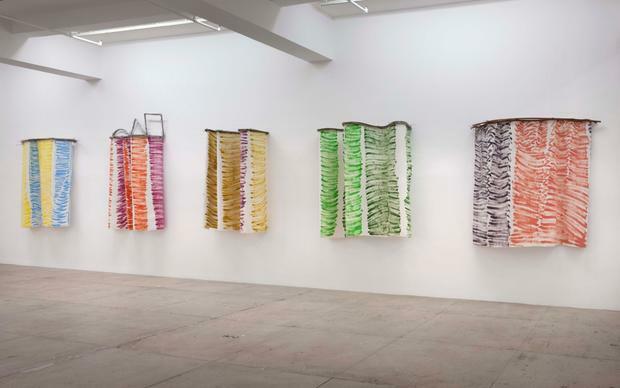 Marian Goodman Gallery is pleased to announce an exhibition of Luciano Fabro curated by Dieter Schwarz which will open on Friday, May 1st, and will be on view through Saturday, June 13th. Known for his poetic, visual intelligence and intuitive, eclectic forms, Fabro was associated with Arte Povera and from the 1960s onwards was known for his sculptural installations which focused on art, nature, mythology, and history. This focused exhibition traces some of the key ideas through a core selection of works from Fabro’s career. Presented are early theoretical works which were conceived as instruments for developing a reflection on perception; tactile works which explore a near baroque sensual experience of color and material; works inspired from personal memory, history, or mythology revealing Fabro’s richness of imagination in relation to antiquity and the classical past and his precise application of this to his own time. Finally, even the image of the artist himself, bravely challenging heaven, is present. Fabro himself offers almost paradoxical descriptions for his imperatives:“I want to do something very complex, but presented in a simple way. Within this simplicity you must be aware of the complexity. 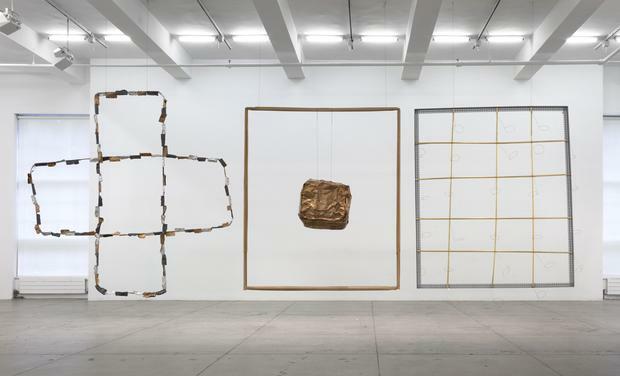 This is what arte povera is about.” He also elucidates that “fantasy, nature, senses, intelligence, and culture provide me with images”. In the North Gallery, the multi panel Attaccapanni di Parigi: I cinque sense (Paris Clothhangers: The Five Senses), 1984 consists of five large-scale curled fabric elements mounted on copper hangers, each element painted with alternate bands of color and each devoted to one of the five senses -- la vista, l’udito, il gusto,il tatto, l’olfatto. The whimsical and illusionistic nature of the 1984 Attaccapanni di Parigi finds an antecedent in Fabro’s earlier Attaccapanni di Napoli( 1976-77), a similar work with sheets of painted fabric hanging from bronze frames whose subject was the varieties of light and shadow as inspired by the sunset on the sea at Naples. Real and painted light on the fabric, real and painted shadows created by its folds, and the way Fabro displays his “clothes” on the wall are all exuberantly theatrical. 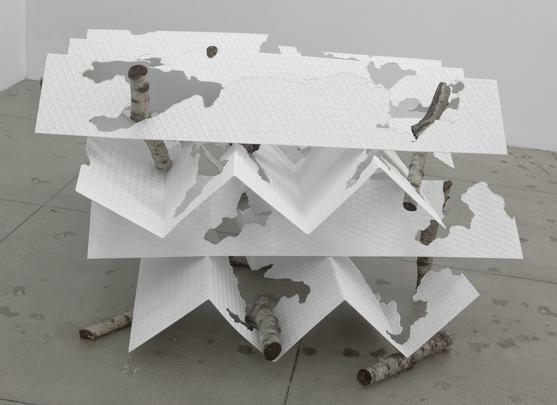 Italia Segata, 2006, is a work in the sequence of works which take as their visual model the well-known outline of the Italian peninsula and for which he used the most diverse materials. 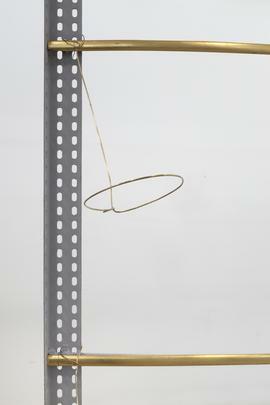 This late Italia variation is made out of steel plates from which the sculpture, Italia in asta, 1994, had been cut. Thus we have the negative remains of this sculpture which are stacked with wooden logs as for a bonfire. The work offers a duplicitous image of its subject as less a beacon than a conflagration. 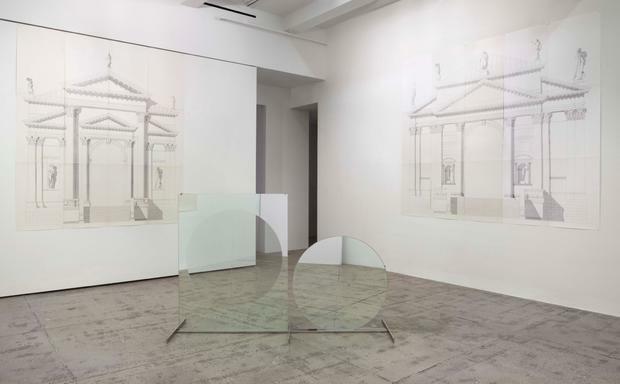 In the North Gallery Viewing Room two early works from 1964, Ruota and Tondo e rettangolo (Circle and Rectangle) crystallize Fabro’s theoretical origins. Experimenting with simple reductive forms, or as Fabro says “common objects deprived of poetic or surreal combinations, but still capable of objectivity”, in order to investigate the empirical perceptions of reality, the objects expose precarious relations. 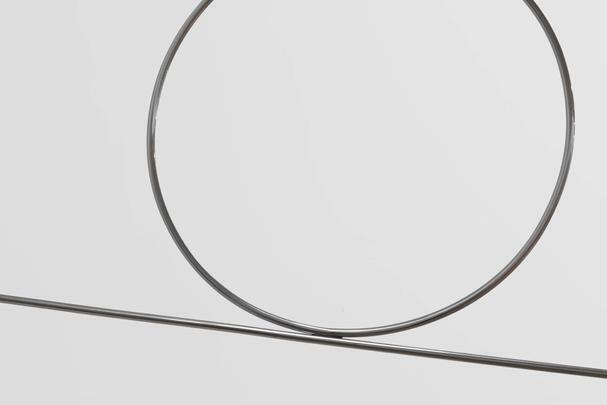 Ruota, a horizontal steel rod hinged high on the wall with a stainless circle placed on top as if rolling on the steel line, creates for the observer a tension between stillness and movement, gravity and instability. Tondo e rettangolo as well is an instrument to address questions of perception and self awareness, here presented in the sculpture’s intricate play of glass and mirrors. 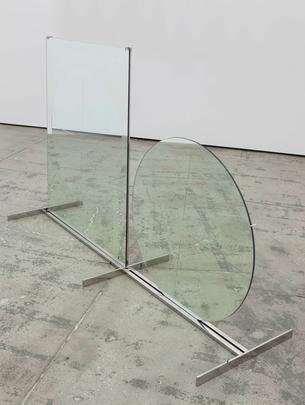 The work consists of two elements in inverse relation: a round mirror placed adjacent to a rectangular one with a transparent round hole of the same dimensions cut out of it. With one element reflecting what is in front and one revealing what is behind, the two objects are contrary to each other, reflecting and non-reflecting, never allowing the observer to build a stable relationship to his field of vision but always throwing him back on the reflection of his own presence. Seen from today, it becomes clear that Fabro had arrived very early on and in a highly original way at issues which became central to post-minimalist American art in the later 1960s. In the South Gallery, two works convey Fabro’s interest in myth and in time. Gioielli/ Jewels (Buddha, Cristo, Zarathustra), 1981, is a sequence of three large-scale individual works which are hanging from the ceiling and assume a powerful presence in the space: Buddha, an iron rod quadrilateral wrapped in natural wood, inside of which rests a bundle of bronze; Cristo a metal scaffold with painted iron rods welded into a grid pattern; and Zarathustra, two iron rod quadrilaterals which form a Greek cross, covered in small leaves, aluminum, bronze, and lead. Fabro describes these works as a “culmination of a search for the synthesis of light, matter, and space. 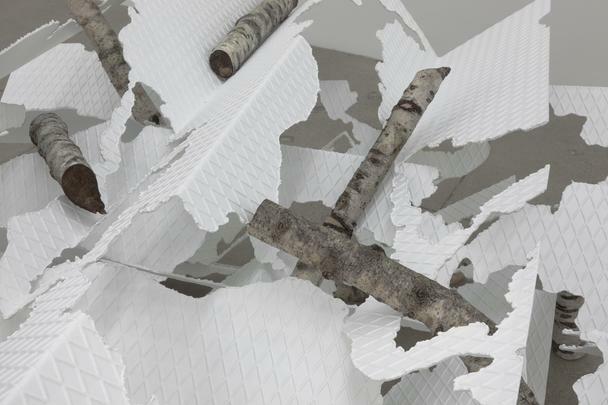 It may seem strange to speak of this in relation to works in which geometry is sketched in, light is broken up, materials seems inconsistent, space is on the border of chaos”. Using simple everyday materials as copper, bronze, and iron, they embody the simplicity that engenders beauty and retain an elusive nature that escapes precise definition. “Now I am thinking of time in a more prosaic and ordinary sense, of those minutes, sometimes hours, sometimes centuries in which an image continues to stimulate people to speak among themselves, to perfect language, until they get to the figural exactness of myth.” -- Luciano Fabro (1992, S F Moma catalogue, p. 106). Luciano Fabro was born in Turin, Italy in 1936. He lived and worked in Milan, Italy until his death in 2007. The first major retrospective since the artist’s death opened last year at the Reina Sofia in Madrid and ran through April 2015. 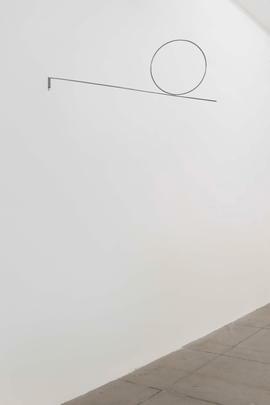 In 2013 Fabro’s drawings were presented at the Kunstmuseum Winterthur, Zurich and in 2007 an exhibition of early works was shown at the Museo d’arte contemporanea Donnaregina, Naples. During his lifetime Fabro’s work was in numerous important solo exhibitions including at the Folkwang Museum in 1981, the Museum Boymans-van Beuningen, Rotterdam in 1981-1982, the Musée d'art moderne de la ville de Paris and at the Nouveau Musée, Villeurbanne in 1987, the Museo di Rivoli in 1989, the Fundació Miró, Barcelona in 1990, the Kunstmuseum Luzern in 1990-1991, the San Francisco Museum of Modern Art in 1992, the Palazzo Fabroni, Pistoia in 1994-1995, the Centre Pompidou in 1996-1997, at the Tate Gallery, London and the Centro de Arte Hélio Oiticica, Rio de Janeiro in 1997, and at the Musée Bourdelle, Paris in 2004. Fabro received a number of prestigious awards in his lifetime, including the Louis-Price award in 1981, the Sikkens Prize given by the Sikkens Stichting in Rotterdam in 1987, the Premio Antonio Feltrinelli awarded by the Accademia Nazionale dei Lincei, Rome in 1993, and in 1994 he received a Coutts Contemporary Art Award. 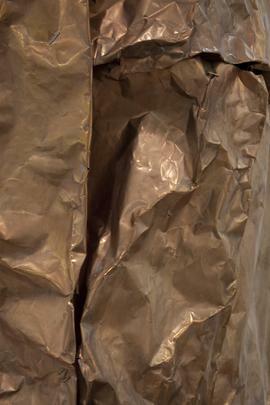 Fabro first participated in the Venice Biennale in 1972 and then again in 1975, 1978, 1980, 1984, 1986, 1993, and 1997. 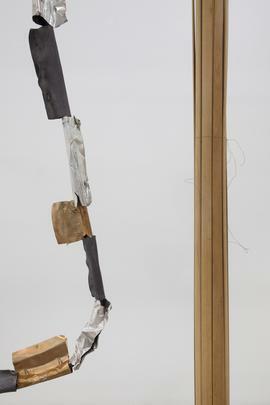 In 1972, 1982, and 1992 his work was shown at Documenta in Kassel. Please join us at the opening reception on Friday, May 1st from 6-8 pm. For further information, please contact the Gallery at: 212 977 7160.